A successful synergy between two prominent Brazilian architectural studios has led to construction of an interesting project in San Paolo, Brazil. Reinach Mendonça Arquitetos designed the architecture of the Girassol Building, an office building entirely occupied by a digital communications agency, which appointed SuperLimão Studio to produce the interior design. The Girassol Building is a small office building which is the home of an important digital communications agency in San Paolo, Brazil. The building was constructed in Vila Madalena, an upper-class neighbourhood in the western part of the Brazilian city. Vila Madalena is known as the Bohemian district for its nightlife and for its status as the city’s centre of contemporary art and culture. There are several contemporary art galleries in Vila Madalena, as well as independent fashion boutiques, informal cafés and live music clubs where bands perform soul, funk and samba. The streets themselves are open-air art galleries featuring brightly coloured graffiti and murals. This eclectic, trendy neighbourhood attracts young professionals and dynamic enterprises, and this is where a prominent digital communications agency decided to build its headquarters. The project involved two important Brazilian architectural studios, albeit at different times: Reinach Mendonça Arquitetos and SuperLimão Studio, whose joint efforts produced this interesting project. On a narrow lot measuring only 500 sqm at no. 953 Rua Girassol, Reinach Mendonça Arquitetos had already designed the Girassol Building when digital communications agency Ampfy moved in, taking over the whole building and appointing SuperLimão Studio to produce the interior design. 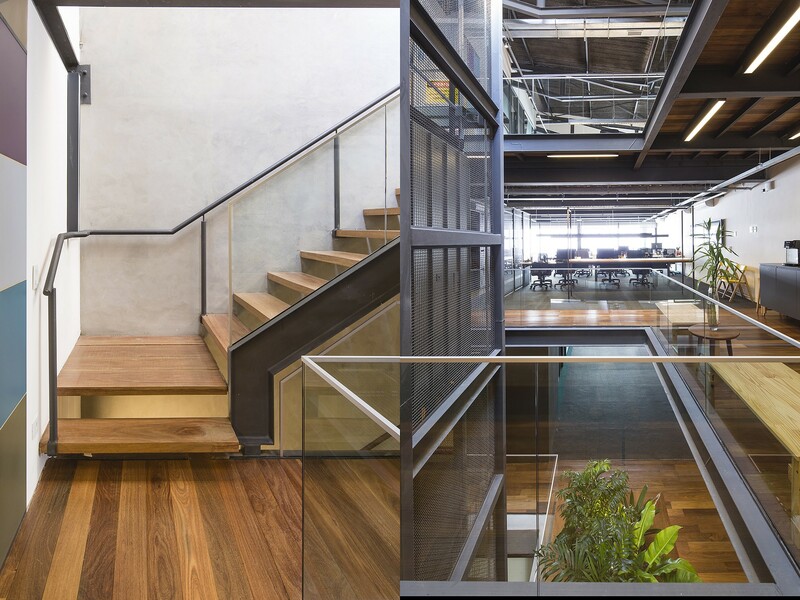 Architects Henrique Reinach and Maurício Mendonça had designed the building for an undetermined use, but in response to local needs they designed it to contain highly flexible workspaces with a light, transparent image. The possibility of either subdividing the space into smaller offices or using it as a single large open space represented the ideal solution for Ampfy. The Girassol Building has a total built surface area of almost a thousand square metres, on three levels of the same size plus an underground parking lot. The building’s structural frame, with pillars resting on the sides of the lot, leaves big bays open on each floor, interrupted by a metal central core containing the staircase and lifts. The building’s layout is designed to improve natural ventilation, and the floor-to-ceiling windows and glass roof let daylight into the interior despite the small size of the lot. A system of perforated sheet metal panels protects the building’s façades against excessive sunlight and ensures privacy inside the workspaces without limiting their visual contact with the world outside. The lot also includes a covered garden, ending in an artistic wall 10 metres high covered with ceramic tiles made by Atelier Leopardi Esperante. Contributors: Guilherme Nakata, Raquel Jordão, Victor Gonçalves, Tony Chen, Mayara Ready, Tadeu Ferreira, Tais Vieira, Douglas Morilhão, Paula Leal and Camila Osele.